I’ve taken many photos from my new W kayak. Herons, turtles, dramatic sky and copious amounts of lake weed. (Ugh, our poor little lake is choked.) Unfortunately, they’re of “snapshot” quality at best. Nothing that stands out as, “Wow, that’s a nice picture!” yet. At high zoom, which I use for the wildlife, the colors get washed out, the depth of field flattens and the images are kinda grainy. 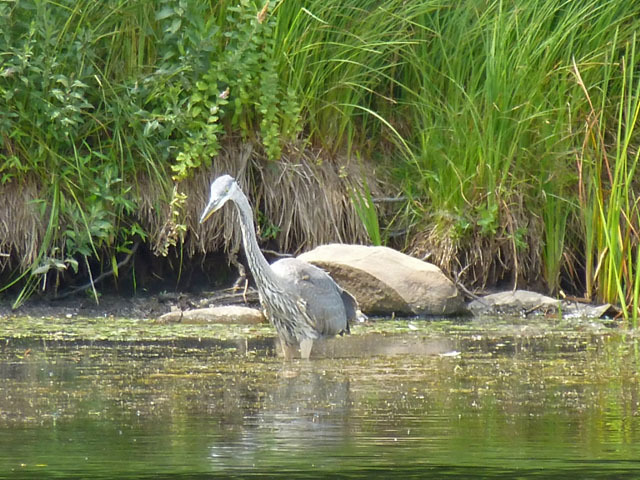 But the good news is that I can’t believe how close I was able to get to the herons without spooking them. It was a bit breezy yesterday afternoon — my first time paddling when it wasn’t dead calm. I was pleased at how easy it was to go both into the wind and cross-wise, and that when I wanted to stay still to take photos, it didn’t drift or spin much. I’m glad I tied a length of twine to the paddle. It has tried to escape a couple of times when I’ve put it down to take pictures. I’ve gotten ideas from the web site for how to keep it in place but haven’t made/tried any yet. And I think I need to sit higher, like on a cushion or something because I keep scuffing my thumbs on the paddle holder clips that Joe installed. I’m having fun with it. Maybe I’ll even take up fishing. I’ve written down some notes of my first impressions and will send a proper review in a couple of months. 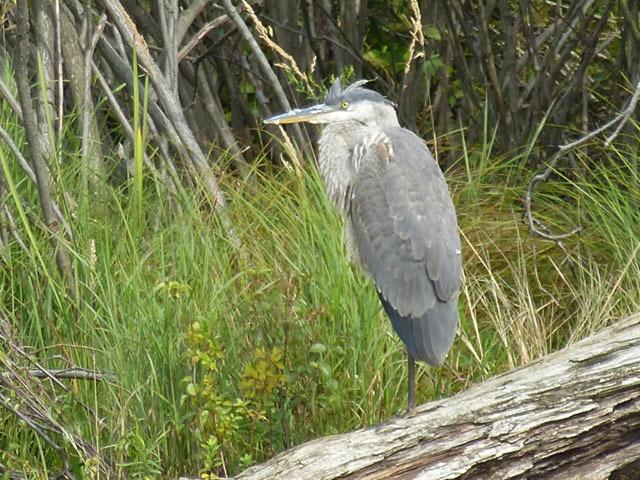 I’ll try to come up with something more creative than “My first season as a complete newbie paddler.” In the mean time, here are a couple of shots of our local herons. Mr Heron standing on one foot on one side of the lake and Mrs Heron fishing on the other. Well, it took 3+ years but I bit the bullet and bought a Wavewalk kayak last summer — and I wished I’d bought one years ago when I first learned about them. In a nutshell… I *LOVE* it! It’s not a sit-on-top so I’m not always sitting in a puddle. It’s not a sit-inside, so I don’t have to struggle to get up and down as if in a bathtub. And because there’s a center hump to straddle, I’m not sitting in an “L” position so I don’t get “Yak Back.” But it helps to have a cushion to sit on. That seat gets hard. It’s symmetrical left to right and front to back so it doesn’t matter which direction I face. It’s ultra stable. It tracks well. It doesn’t drift around too much. And it’s PERFECT for lakes or bays, even many slow-moving rivers. It draws very little water so it can be used in shallow areas like swamps too. It can be used sitting or standing, paddling or poling. The company owners love to see what we’ve done with them. Fishing, duck hunting, wildlife photography, paddling around or sunbathing/stargazing in the middle of the lake. Now that I’ve got one, it gets the double-thumbs up from me. If you are interested in one too, your local dealer will arrange for a test ride. Bring your wallet cos you’ll want one. Kai- The photos are great. The Wavewalk paddle resists rolling but slides easily and makes a fair bit of noise when you place it on the gunnel. An easy way to solve both of these problems is with some grip-wrap such as Gamma Supreme. It also has the advantage of working wherever you drop the paddle as opposed to just where you have attached foam. A thin strip of black tape at the center of the paddle will make it obvious at a glance that the paddle is centered even when you are focused on taking a photo. I cut up a noodle to put on the W500 & W300, hold the paddle with no noise at all. Place them on and cut a groove for the paddle, they stay on nicely, even on the highway.